If you have finished with the layer, you can close all the windows on the current layer by going to Window > Close Windows On Layer. You must have the layer you wish to close the windows on selected when you click this option. If you wish to close all windows on all layers, go to Window > Close All Windows. If you have created a layout you wish to use again, go to File > Advanced Load/Saves > Save Screen Layout. More information on Loading and Saving can be found here. 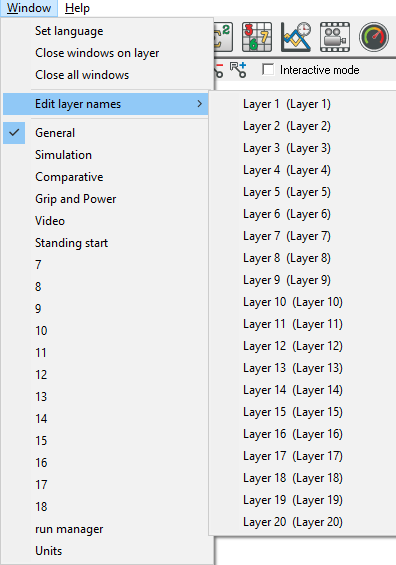 As you start up the program, you will be prompted if you want to load the default layout from a file, which take a few seconds to open up a lot of predefined windows and settings, and organise them into the different layers, which have been renamed, detailing what the layer is used for. Once this process has passed, you will be able to quickly switch between the layers, allowing you to look specifically at the different measurements and to control different aspects of your data and how you analyse and compare it.